When you hear people talking about depression, one term that will often be used is clinical depression. Whilst many people only have a basic grasp of the signs of depression, clinical depression symptoms can be even harder for them to understand. 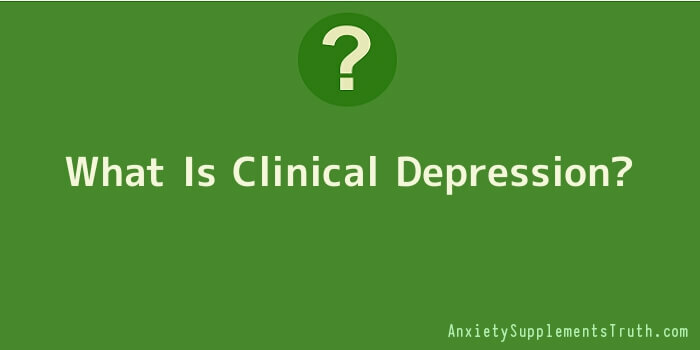 In actual fact, clinical depression is the term that is given to anyone who is in a depressive state that lasts for more than two weeks. Severe clinical depression will be much more intense and low periods can last for months at a time. It is at this stage where clinical depression treatment is needed. When a person is clinically depressed they often need some form of intervention to get them the depression treatments that they need. This can come in the form of help from a psychologist or intensive counselling sessions from a dedicated therapist. Many individuals who suffer from clinical depression will also find that they have issues with anxiety. They will often start to exhibit anxiety symptoms prior to becoming depressed and this can then lead to a state of clinical depression, if they are not treated. In order to live with clinical depression a person who suffers from it needs to know and recognise the early symptoms of clinical depression. Knowing these will help the person to understand the way they will start to feel at the start of a depressive episode and encourage them to speak with their healthcare professional earlier. Failure to see the signs of clinical depression can result in a very low mood for extended periods of time, which can become severe if left untreated. Usually, the first time a person has an episode like this they will try to deal with how they are feeling themselves. They will usually think they will ‘snap out of it’ and that they will soon be feeling fine again. They will often not fully realise what is happening to them until they are in the middle of a full blown depressive episode. It is then at this point when a person will be most at risk of having suicidal thoughts, so getting clinical depression help is an absolute must. Today, thanks to the advances in knowledge and treatments it is possible to live with clinical depression and get it under control. However, the first step is to get a positive clinical depression diagnosis, as this makes understanding the condition a whole lot easier. Whilst clinical depression is no walk in the park, it is helped by other people recognising your condition and being able to give you the help and support that you need during the times when you are feeling low. Clinical depression is coming out of the woodwork and being talked about a lot more than it used to be and this is good news for sufferers. With more understanding and knowledge on the topic, people are realising that it is not a condition that can be passed from person to person, but one that needs to be handled with care and compassion. It is important to remember that no one is perfect. Many people who suffer from depression started the downward spiral because of thinking that just because they do not always do or say the right thing, there is something wrong with them. Focus on the qualities about yourself that you and everyone else admire. Yes, focus on your good points and use these to form a positive opinion of your overall self. This simple step can help you on the road to recovery. Do not depend on herbal alternatives to medication like St. John’s wort. Trials of herbal remedies show that they are far less effective than pharmaceuticals, especially for moderate to severe depression. If you are wary of using medication to treat your depression, try talking therapy as a first-line treatment. Depression can have many root causes and you should do your best to try and figure out what is the root of your personal depression. Once you are able to better understand what is causing you to have these feelings, you should be able to handle the hard moments much better. While living in the past is one of the worst things you can do when it comes to depression living in the future may well be one of the best things you can do. As the old saying goes where there is hope there is life, and a bright future provides hope. If your income is low and you are suffering from depression, try and find free or low-cost social services that can help you. For example spent some time to write some blog post based on your interest. By blogging, not only can help you release stress, blogging can make money as well. Local governments offer community counselling services to those with low incomes, especially those people who qualify for Medicaid. These community counselling centres can also provide free samples of medication for those who can’t afford to fill a prescription.